Material compatibility remains one of the largest question marks for those looking to use chlorine dioxide gas, and there’s a lot of conflicting information on the topic. Chlorine dioxide gas cannot be stored and shipped, so it must be generated at the point of use. The method of generation, and its resulting purity, has a great impact on the material compatibility of the chlorine dioxide gas product being used. One of the first large scale decontamination projects utilizing chlorine dioxide gas was the oft referenced Hart Senate Building decon performed in November 2001. It was performed by a company who previously used its CD gas technology for controlling odors in oil wells. As material compatibility was never an issue in this previous application, they used a less refined process of generation which contained acidic byproducts. When used in the Hart Senate Building, some material issues and corrosion occurred. ClorDiSys was established after this, and our chlorine dioxide gas is generated by passing a low concentration chlorine gas through a proprietary sodium chlorite cartridge to convert the chlorine gas into pure chlorine dioxide gas. Our process does not leave a residue and does not require any additional clean up once the gas has left the space. ClorDiSys has done studies with electronics and found that they stand up well after multiple exposures. Computers have been exposed to the gas for over 25 cycles and have been fully functioning afterward. 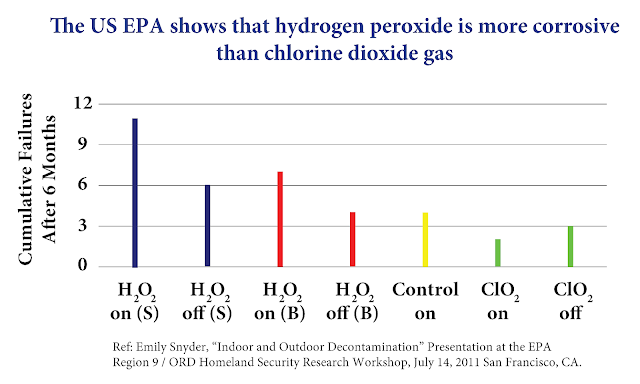 In fact, chlorine dioxide gas was chosen to decontaminate the inner chambers of a $3,000,000 Transmission Electron Microscope over hydrogen peroxide vapor because of its superior material compatibility as proven through manufacturer testing. The US Environmental Protection Agency (EPA) commissioned a study exposing computers to chlorine dioxide and hydrogen peroxide over the course of 6 months. Below are the test results showing chlorine dioxide had the lowest amount of failures. Not all chlorine dioxide gas products are the same, and we understand the hesitation considering some of the information available regarding corrosion. 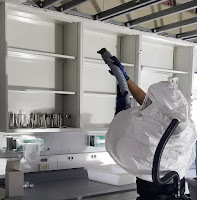 That’s why we offer free* material testing to give confidence that our chlorine dioxide gas will be safe on your materials and sensitive items. Can Chlorine Dioxide be used with Organic Foods?